Insane neon coral platforms featuring a rounded toe and curved heel with spike detailing. Fully lined interior, cushioned insole. Looks rad paired with a body-con dress and moto jacket! 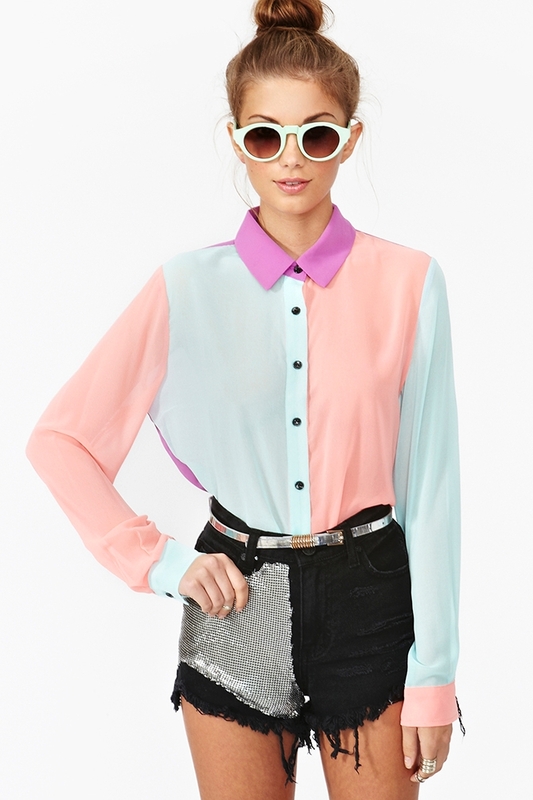 Sweet chiffon colorblock blouse featuring pastel pink, turquoise and violet panels. Black button closures, cut longer at back. Perfect tucked into high-waist cutoffs with wedges! Totally awesome knit featuring a stars & stripes print in shades of red, cream and navy. Scoop neckline, ribbed hem. Wide, boxy fit. Looks super cute with cutoffs and ankle boots! By John Galt by Brandy & Melville. 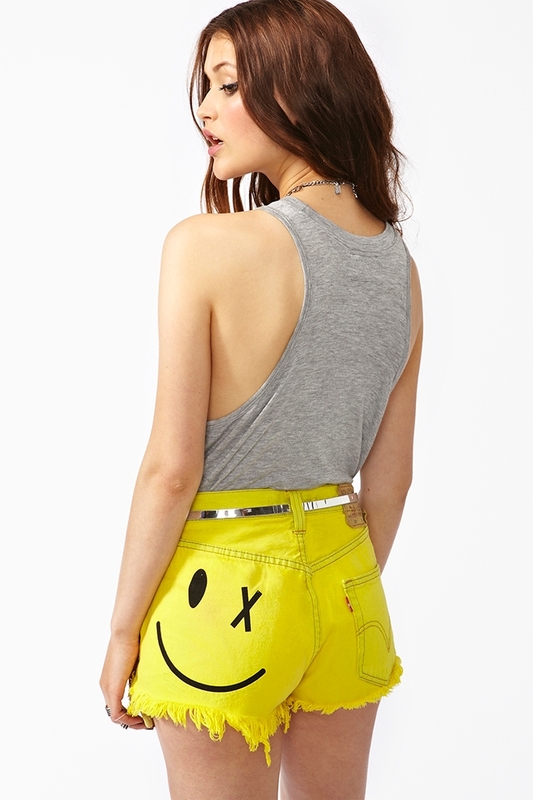 Destroyed yellow vintage Levi's denim cutoffs featuring a black smiley face print at back. Front pockets, back pocket. Button fly. Due to the one-of-a-kind nature of this product, each pair may vary slightly. 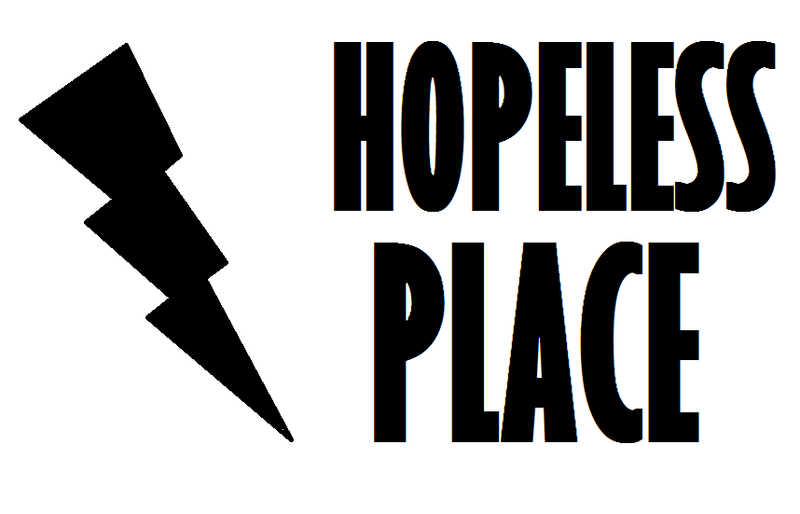 Looks rad paired with a loose tank and moto boots! By Bitching And Junkfood.